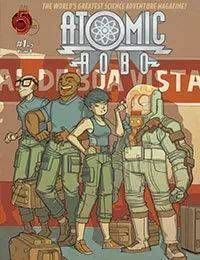 Atomic Robo investigates cryptid sightings near the old Nazi space program, Science City, buried deep in the Venezuelan wilderness. Meanwhile, a mysterious package is delivered to Tesladyne - from Hashima Island Quarantine Zone. Is it from Alan? Majestic 12? Or something else entirely? If only the title could shed some light on this mystery!